So Jennifer Summerfield, aka Trillian Stars, is a romantical actress who lives in a sweeping fireplace- and victrola- and staircase- and art-filled Philadelphia house with her equally romantical husband, photographer Kyle Cassidy, and some very famous cats. 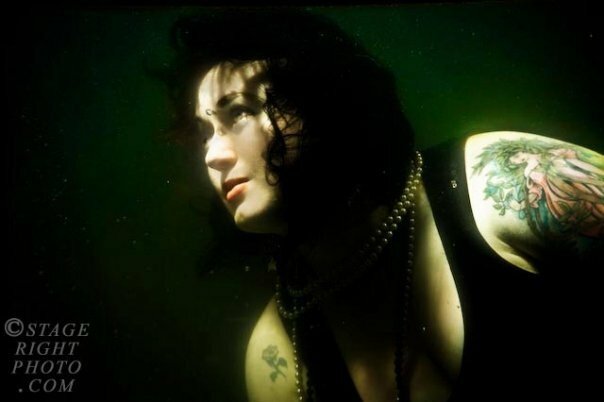 When not emoting on stages or swooning in front of fires or being laced up into shimmering corsets or wandering around Paris in mystical trances, she can sometimes be found gliding about in mermaid tanks, like that of mermaid photographer extraordinaire Annaliese Moyer. You might think that Jennifer comes from the sea itself, with her seafoam skin and radiant tresses, but she’s actually from Wyoming and comes from a long line of gun-toting pioneer women. I know, it is almost too much to bear. 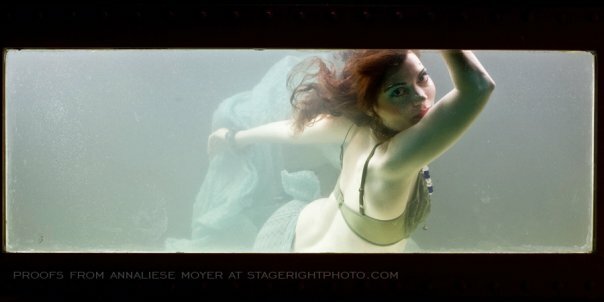 What was it like becoming a mermaid and entering Annaliese’s mermaid tank? It was a dream come true for me, but I also came to realize what a lonely existence it can be for mermaids—when you’re under the water, there’s only the distorted sounds of your own heart beating, and though you’re straining to see the people and objects around you, in the dark, all you have are the shadowy forms looming in the distance. So I have a greater empathy now for mermaids and their need to play mischief as a way to make contact with the outside world. I realized that in order to survive in that environment, you need to have a strong sense of self and you need to trust in your own charm, beauty and power. 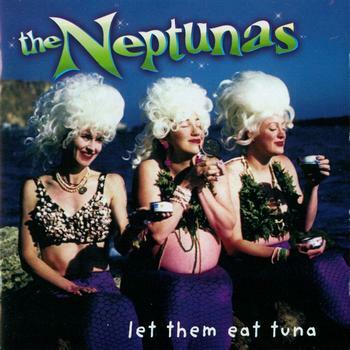 I also came to realize that mermaids need thicker skin to withstand the cold temperatures; even though I was in a heated luxury tank, I was shivering by the time I emerged. 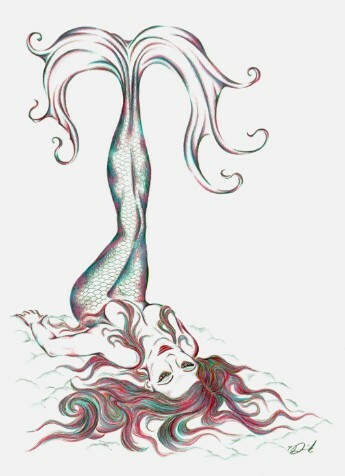 Have you always liked mermaids? Yes, when I took swimming lessons as a child, I would grab a piece of styrofoam between my knees and swoosh my legs back and forth, pretending I had a long glittering tail with fins. When I was about 7, there was a series of bath toys called “Sea Wees”—beautiful mermaids with matching merbabies; each pair came with their very own foam lily pad so they could float on the surface of the bath water and pose alluringly. Naturally, they also had combs; mermaids love to brush their hair! And of course, my favorite movie in the third grade was Splash. It just doesn’t get more romantic than that! As an actress, how would you approach playing a mermaid? Mermaids have a natural curiosity that people so often lose as they get older and more jaded, perhaps because there are always so many discoveries to make in the sea—it’s hard to grow complacent. So I would start by taking my nephews and niece to the Camden Aquarium to pet the sharks and key into that innocent notion of wonder and discovery. I think I’d also spend a day or two in Coney Island, looking at shiny things and watching the sun glint off the water. I would also take dance classes—perhaps belly dancing—because mermaids have such natural, seductive grace. Never lose your sense of wonder and always ask yourself the question “what if…?” If you ever find yourself hesitating at the crossroad between Safety and Living out your dream, choose the dream. Mermaids don’t believe in regret. Annaliese also takes stunning pictures of live shows, horses, and all other manner of thing, so you should check out her website. But when she and I talked recently, it was all mermaid. 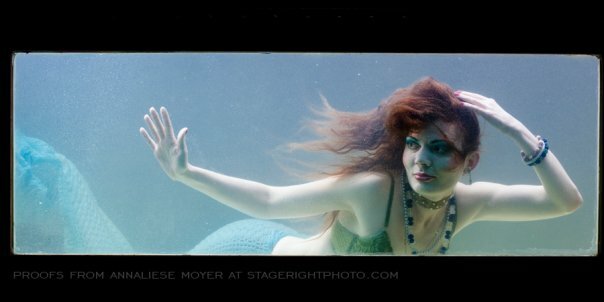 When did you start photographing mermaids, and how exactly did you become the proprietress of a real live mermaid tank? 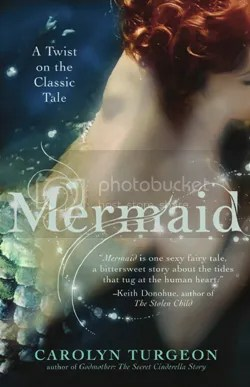 I started photographing mermaids in my youth when sailing with my family. Sadly, all those Instamatic pictures were not of high enough quality for anyone to be able to make out the mermaids in them. I wonder now if that is part of what drove me subconsciously to become a professional photographer. It does seem awfully synchronous that I am photographing them now, doesn’t it? My recent experience with mermaids came about as a result of the mermaid tank. On a local theatrical group’s page, I saw that Portland’s Theatre Vertigo wanted to get rid of their tank from their production of Freakshow. They needed to be out of the theater, and no one in the company could and/or wanted to give this glorious set piece a home. I mused that it would fit in with my kind of vintage/distressed kind of aesthetic, so I emailed to say I’d be interested. I was saddened to hear that someone else had claimed it first. But, their deadline day rolled around and I got a frantic phone call. The person who had dibs on the tank had not showed up. Could I get there with a truck and collect it… immediately? Luckily for me, my neighborhood is filled with inventors, and creatives and makers of all kinds, many of whom have trucks to aid in those efforts. I borrowed one, drove downtown, and claimed my tank. But, I did not yet know it was a mermaid tank. I did not even know what I might wind up doing with it. Within a day or two, I heard from my friend Tanya Burka, world renowned aerialist. “Hey Annaliese. I am going to be in town next week. I owe you some modeling. 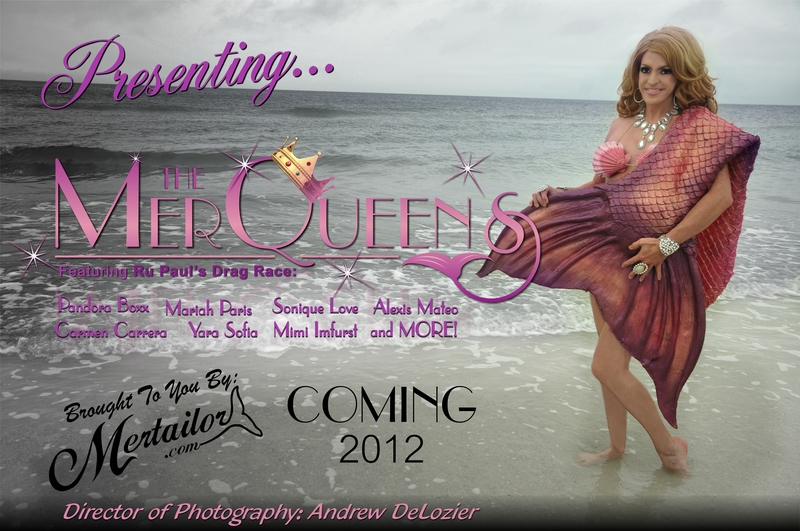 Do you have anything in mind?” Hmmmm… tank… gorgeous performing artist/contortionist… MERMAID! Tanya was more than game to be the first mermaid in the tank. I made my first mermaid tail from a scary old lace tablecloth, and my friend John Wenderoth, one of said genius creative makers in my neighborhood, and a handsome devil, helped set up the tank on a stand in my carport. Yep, almost all the mermaid images to date were made in the carport. 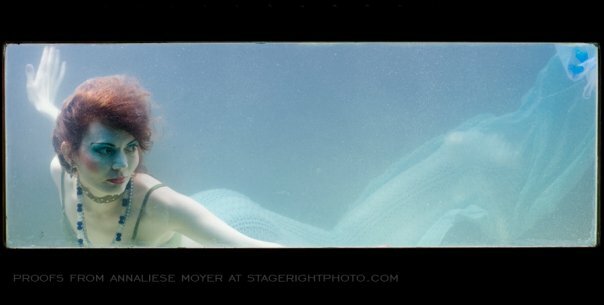 As I told him about the shoot that was shaping up, he said, “I’ll get in the tank with the mermaid lady.” And, immediately I saw the whole story for the shoot. That first shoot was grueling. Technically, I was flying by the seat of my pants. Water, reflections, electricity, submerged subjects… but, the result was magnificent. The images from that shoot were the most beautiful things I had ever created. One is the cover of my web site, and another graces my business card (and serves as the final end papers for last year’s Spectrum Art book). Do you have any makeup and/or general beauty tips for mermaids? Obviously, waterproof is required for mermaid make up. Most of my fair subjects have used regular make up and applied a theatrical product to keep make up in place, even in these extreme shooting conditions. One example is Ben Nye’s Liquid Set. It can also be mixed with non-waterproof make up to give it some staying power. Commercial waterproof make-up can also be used, but I always feel more secure with some wet set product on top. They are available from local theatrical supply stores or on line. 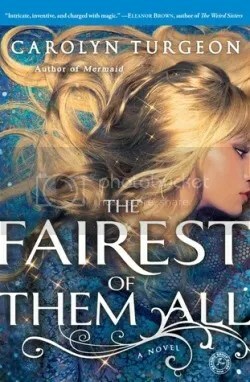 We have had mermaids with all sorts of looks, but I should tell you that people seem to be the most consistently drawn to the mermaids with long hair, either clouds of curls suspended around them or long streaming ribbons creating gossamer shapes in the tank. However, hair is just another thing that might not cooperate for the camera underwater. It tends to have a mind of its own. Practice, practice, practice my long haired beauties. If wigs are used, fasten them down tight. They come off in the water. Trust me. I believe I was with you, Annaliese, the first time you yourself entered the mermaid tank. What was that like for you? 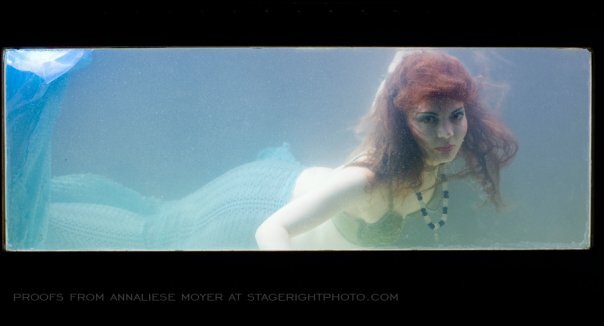 It was broiling hot day, and while I photograph the mermaids in the tank under cover of darkness (mysterious, no? ), I was over heated and drenched in sweat by the end of that shoot. It seemed that not only would getting in the tank be a great way to cool off, but that being as I was asking some terrestrial maids to work underwater, I really should understand first hand just what the experience was like and what the demands were. If you are not a real mermaid it is HARD to play at being one and make it all pretty for the camera and its endless technical demands. Keep your eyes open! Don’t puff out your cheeks! Stay in the middle of the window! Don’t let the hair cover your face! Make the tail pretty! But, it is quite magical. I think every mermaid I have photographed has been exhausted by the end of their shoot but loathe to get out of the tank. I’d love to do it again. 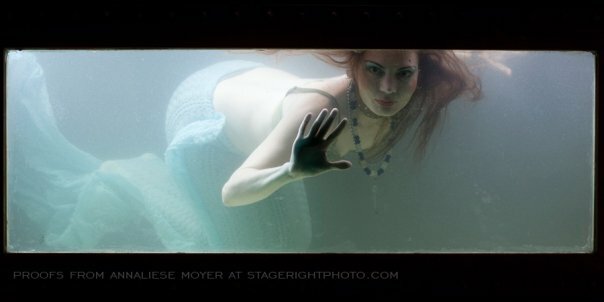 What is the best way to go about photographing mermaids? Have you learned any special tips you can share? I have only just begun my own exploration of photographing mermaids. Using the tank is excruciating—something different has gone wrong every single shoot. It is a very unforgiving environment. When I found myself thinking that it would be much easier to photographing underwater myself, I knew I was kidding myself. Of course, that is next on my list. I have all sorts of images in mind that will benefit from movement and space. I also want to look at some more above water looking in, and some over and under stuff. That is the fun of this project, it has so much possibility, and I feel just guided down the path by it all. Make your dreams happen! But, do be safe. Build up to your final goal step by step. Don’t get in the water with a restricted range of movement off the bat, and never on your own. Look on line and find some of the great videos other mermaids have made, sharing their knowledge and experience. Haunt thrift store for bits of clothing that can easily be altered into suitable mermaid attire on the cheap. 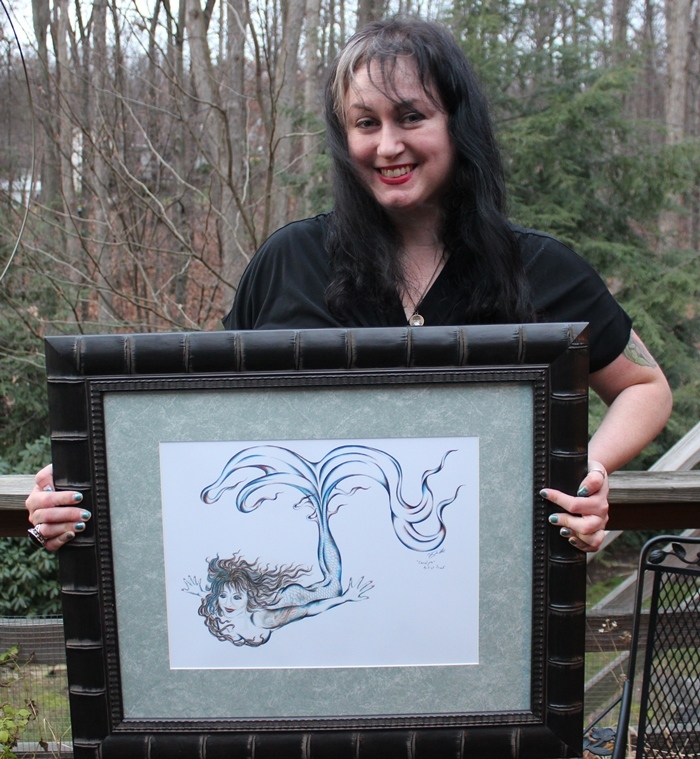 And, hey, call me—maybe we can collaborate and make some mermaid art happen! So you may remember the interview here with Terri Windling a few months back… Terri being a very beloved artist, editor, writer and expert in folklore and myth and fairytale, lover of mermaids and swan maidens and fairies and all other kind of magical creatures and magical things, and now she’s in need, and a number of artists have come together to do a fundraising auction. 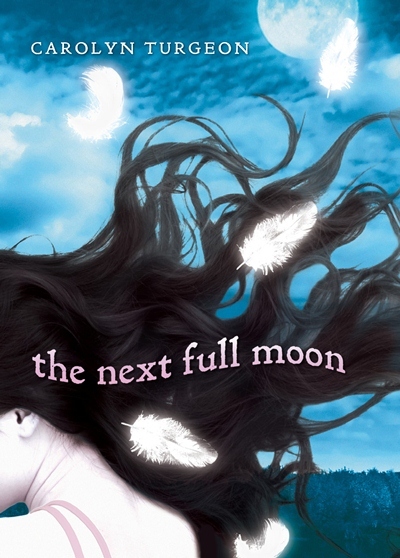 So from now until mid-December you can bid on all manner of gorgeous thing… LIKE for example you can get a signed book package from yours truly (plus I will throw in my first middle-grade novel, The Next Full Moon, which comes out in January), or you can become a character in a Holly Black novel, or name a character in a Catherynne M. Valente or Cory Doctorow novel, or get some signed original art from Charles Vess (whose mermaid interview you’ll see here shortly), or get a poem written for you by Jane Yolen, whom I interviewed here back in February, or get a handmade faerie doll from Wendy Froud…. and/or many, many other amazing things besides, from all kinds of gorgeous and fantastical artists. Or offer something wondrous to the auction yourself! 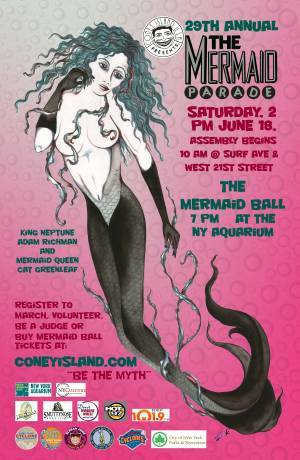 As we all know, every auction could use more mermaid art and mermaidliness in general.